Docket Navigator and the Docket Report now include information on International Trade Commission Section 337 patent infringement investigations. Just like district court cases, we now monitor every ITC investigation every day and report every significant event. This includes new investigations, remedies, claim constructions, patent determinations, and significant rulings all with free links to the underlying ITC documents. You can also search ITC investigations using Docket Navigator and all ITC documents are available for free download! Here’s the best part. This new information costs you nothing extra -- everything is included in your existing subscription. If you receive the Docket Report, access to the Docket Navigator database (including the new ITC information) is included in your subscription. If you haven't tried Docket Navigator and the Docket Report yet, please contact us at trial@docketnavigator.com and we’ll provide you with a free trial right away. The administrative law judge sanctioned respondent for false statements made in its opening statement and pre-trial brief regarding respondent's arguments and evidence concerning a disputed claim element, i.e., whether respondent's application registry included a list of all currently accessible software applications. "Boiled down to the essentials . . . Complainant was deceived by arguments made by Respondent and had to exert time and effort to rebut Respondent's statements concerning the Apple App Store. I also find counsel's opening statement misrepresented the evidence Respondent proffered and contradicted its own Pre-Hearing Brief. . . . In what has to be the legal equivalent of 'the dog ate my homework excuse,' Respondent blamed its misrepresentation upon a combination of miscommunication with a law firm associate and the press of litigation before the ITC. . . . Even in combination, Respondent's proffered excuses are not excuses any judge can ever accept, for if we were to do so, they would swallow accountability. . . . [L]arge amounts of time and treasure are expended by all parties in reliance on [pre-hearing] briefs, which makes accuracy essential. . . . It is also an imperative that counsel be held accountable for making accurate opening statements to the presiding judge. . . . Complainant's suggested remedy, i.e., deem infringement admitted for the 'application registry' element of claim 12, is too extreme. Thanks for Complainant's adroit questioning of [a witness] and [the witness's] honesty, the matter was clarified and harm to Complainant was limited. Hence, it is inappropriate to exact any evidentiary sanction . . . ." Instead, the court ordered complainant to prepare a time and expense reconciliation "of all effort it reasonably incurred" in connection with counsel's misrepresentation. The court found that the attorney-client privilege did not apply to plaintiff and a deposed inventor and ordered that if plaintiffs presented evidence from the inventor, defendants would be able to cross-examine the witness about any communications with plaintiff's lawyers about any case involving the patent-in-suit. "[Plaintiff's outside counsel] volunteered his legal assistance to [the inventor] at no charge even though [the inventor] was already represented by a lawyer not involved in [plaintiff's] patent litigation. [Plaintiff's counsel's] only motive in thus volunteering could have been to discourage [the inventor] from giving any testimony at his deposition that might be helpful to [defendants] or other Android affiliates in their patent war with [plaintiff]. . . . [Plaintiff's counsel's] retention agreement with [the inventor] required [him] not to waive attorney-client privilege but gave [plaintiff] the power to waive [the inventor's] attorney-client privilege regarding any communications he had with [plaintiff's counsel]. [The inventor] neither required legal counseling from [plaintiff's counsel] to 'protect' him from [defendants] nor, so far as I can determine from the affidavits, received any. I conclude that no bona fide attorney-client relationship was created and that Apple’s assertion of attorney-client privilege is unfounded." See orders addressing the attorney-client privilege. To view orders in the context of a particular type of motion (e.g., motion to compel, motion in limine, motion to strike, etc. ), apply filters in the blue boxes along the left margin of the page. See a list of orders addressing accusations that certain arguments or statements by counsel were improper. Examples include arguments addressing excluded evidence, conflicting with the court’s claim construction, and highlighting opposing counsel’s faith. The court denied in part plaintiff's motion in limine to preclude defendant from appealing to the jury's "pecuniary interests" by arguing defendant's medical products cost less. "[Defendant] will not be permitted to appeal to the jury’s pecuniary interests by directly arguing, or even suggesting, that the jurors’ medical costs will increase if they find infringement. That does not mean, however, that [defendant] will not be permitted to present any evidence about the relative cost of its products, if that evidence is relevant to another issue in the case." The court granted in part defendant's motion to exclude the revised opinions of plaintiff's damages expert where the expert derived a royalty rate from defendant's revenue-sharing agreement with a third party. "[Defendant] is correct that the [revenue-sharing] agreement cannot be considered under [Georgia-Pacific] factor 12. 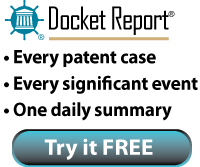 The agreement is not a license agreement for a patent or patents. . . . [Plaintiff's expert] may consider the [revenue-sharing] agreement and the revenue or profits obtained under it as evidence of the value of [defendant's] alleged use of the patented technology under Georgia-Pacific factor 11. However, [he] may not extrapolate a royalty rate from the [revenue-sharing] agreement and use that derived royalty rate as support for the reasonableness of his 0.60% royalty rate." See a list of orders addressing the calculation of royalty rates in various contexts. To limit results to a particular court or judge, use the search filters located on the left margin of the page. The court denied defendant’s motion to dismiss plaintiff’s indirect infringement claims under Fed.R. Civ. P. 37(b)(2)(A)(v) (authorizing dismissal for failure to obey a scheduling or pretrial order) for alleged failure to identify third party direct infringers because the local rules contain no such requirement. "Because the disputed contentions disclose information sufficient for [defendant] to determine [plaintiff’s] theories of infringement, dismissing [plaintiff’s] indirect infringement claim is unwarranted at this point. The contentions identify a specific product line . . . and thus provide [defendant] with notice that [defendant] indirectly infringes the Asserted Patents when [its accused products are used in an infringing manner] by a customer. . . . While the contentions do not identify which specific customers perform this [infringing use], [defendant] has identified no case requiring a disclosure under Rule 3-1(d) of the specific third party committing any underlying act of direct infringement." The court ordered plaintiff to "reduce the number of asserted claims to twelve" and "identify which claims are asserted against each Defendant." When must plaintiffs limit the number of asserted claims? The court denied defendant's motion to amend its answer to include a claim for inequitable conduct where defendant did not plead facts sufficient to support a reasonable inference of a specific intent to deceive. "In [Therasense, Inc. v. Becton, Dickinson and Co., 649 F.3d 1276 (Fed. Cir. 2011)] the Federal Circuit wrote that the specific intent to deceive must be the single most reasonable inference to be drawn from the evidence. Some confusion has arisen as to whether this language applies to a party’s pleading or whether the standard discussed in Exergen applies. Although there is a split of authority on the issue, the Court finds that [Exergen Corp. v. Wal-Mart Stores, Inc., 575 F.3d 1312 (Fed. Cir. 2009)] sets forth the standard to be used to analyze whether [defendant's] inequitable conduct charge pleads sufficient facts to set forth a viable claim for relief. . . . As a result, the Court will examine whether [defendant] pled sufficient facts from which a reasonable inference can be drawn that material information was not given to the PTO because it specifically intended to deceive the PTO. . . . It is not reasonable to infer that [a named inventor] had a specific intent to deceive the PTO simply because he did not reveal one aspect of the results published in his 1995 article. This is especially true since [defendant] does not allege that [the inventor] had any role or involvement in the prosecution of the [patent-in-suit]." What types of allegations are sufficient to plead intent to deceive after Therasense? The court granted defendant's motion for Rule 11 sanctions following summary judgment of noninfringement and rejected plaintiff's argument that "a dispute over claim construction cannot be the basis for a sanctions motion [under] Q-Pharma, Inc. v. Andrew Jergens Co., 360 F. 3d 1295 (Fed. Cir. 2004), in which the Federal Circuit concluded that the plaintiff's claim interpretation, 'while broad, followed the standard canons of claim construction and was reasonably supported by the intrinsic record.'" "[I]n this case . . . Plaintiff's claim construction violates all the relevant canons of claim construction. I cannot conclude that an 'analysis' that adds words to the claim language in order to support a claim of infringement 'follow[s] standard canons of claim construction.'. . . To the extent that [plaintiff] is arguing that it is immune from sanctions simply because its attorneys aver that they construed the claim and compared them to the product before filing suit, it is simply wrong. . . . [T]he document on which [plaintiff] relies to support its claim of conducting 'pre-suit analysis' does not appear to be a pre-suit document. The only date the document bears is. . . more than two months after this lawsuit was filed, at a time when counsel for the parties were engaged in a debate over the merits of a claim already asserted." When are Rule 11 Sanctions appropriate? Since early 2008, more than 100 motions for Rule 11 sanctions have been filed in patent cases. Of those, only 7 were granted -- and one of those was later withdrawn upon reconsideration – making the overall grant rate less than 6%. View summaries of orders granting (or reconsidering) Rule 11 sanctions here. In November 2011, Judge Alsup appointed a damages expert under FRCP 706 because the parties' widely divergent views of damages (Oracle valued damages in the $1.4 billion to $6.1 billion range while Google calculated damages at between $0 and $100 million) required "an independent economic expert . . . [to] aid the jury." Having made the appointment, Judge Alsup recently granted in part defendant's motion to exclude portions of the expert's report and testimony because the expert did not tie valuation of a hypothetical license to the IP rights asserted in the litigation. "This Court’s prior order held that the hypothetical license must be 'tailored to the amount and type of infringement that actually occurred' and that 'the reasonable royalty must compensate for the infringing features, but not for non-infringing ones'. . . . [The appointed expert's] second and third explanations for equating the value of the IP in suit to the entire Java ME IP portfolio are inappropriate for the hypothetical negotiation scenario. Significantly, [the expert] fails to take into account that at the end of the hypothetical negotiation, [defendant] gets a license to the IP in suit, nothing more. . . . If [defendant] was liable for the value of the entire IP portfolio each time a single IP in that portfolio was asserted in an infringement action, then [plaintiff] would be overcompensated." The court granted defendants' motion to dismiss plaintiff's amended complaint where plaintiff dropped its infringement claim and instead sought a declaration that its patent was valid. "[T]he court has uncovered no case in which a patentee seeks a declaration of validity. Indeed, [plaintiff's] patent is presumed valid. . . . Although [defendant] may have asserted its belief that the [patent-in-suit] is invalid in pre-litigation conversations with [plaintiff] and in response to [plaintiff's] original complaint alleging patent infringement, [defendant] has never brought a claim, counterclaim, or other action against [plaintiff] seeking to invalidate the patent." Because venue is often contested in patent cases, the first-to-file rule frequently comes into play. In fact, since early 2008, district courts have applied the rule in at least 168 cases. Here is a list of those order summaries. The court granted defendant's motion to dismiss plaintiff's declaratory relief action under the first-to-file rule even though plaintiff was not a defendant in the first-filed action. "The Federal Circuit has not ruled on the precise question of whether identity of the parties is required under the first-filed rule. . . . [W]e find that looking to which court first obtained possession of the subject of the dispute, not the parties, is particularly appropriate in the instant case. The record indicates that [defendant] was attempting to ascertain the name of the proper [plaintiff] entity against which to file suit, that [plaintiff] made no efforts to disclose the name of the entity, and that once [defendant] learned the name of [plaintiff], it promptly added the entity to its new complaint." Discovery of Prior Settlement Agreements and Negotiations Permitted "as the Exception and Not the Rule"
The court granted defendant’s motion to compel the production of draft license agreements and communications regarding license negotiations between plaintiff and third parties entered into to resolve past claims under the asserted patents. "Plaintiff’s business is to litigate and license. [Plaintiff] does not openly compete with Defendants in the marketplace. Accordingly, the settlement communications will be a valid consideration in determining whether the settlement agreements themselves accurately reflect the patents’ value. . . . The Court therefore will require production of the draft license agreements and underlying settlement negotiations in this case. However, the Court cautions future litigants that such production will be viewed as the exception and not the rule. Settlement negotiations are always suspect to some degree and are often littered with unreal assertions and unfounded expectations. The Court is aware that assertions made during settlement negotiations are generally made to ‘close the deal’ and are not always grounded in facts or reason. Accordingly, while the Court allows discovery of the negotiations and settlement discussions at issue, the Court intends . . . to thereafter direct its attention and scrutiny to the weight and degree that should properly be afforded to such negotiation materials." Since ResQNet.com, Inc. v. Lansa, Inc., 594 F.3d 860 (Fed. Cir. 2010) courts have been reconsidering the conventional wisdom that litigation-induced or settlement-induced license agreements are unreliable when it comes to calculating damages for infringement. The issue tends to arise in two contexts: (i) discoverability of the licenses or negotiations concerning the licenses and (ii) admissibility of that same evidence. This list provides summaries of court orders addressing the discoverability or admissibility of litigation-induced or settlement-induced license agreements and/or related negotiations since ResQNet. The court denied defendants' motion for a new damages trial despite defendants' argument that the court's four-hour time limit to present evidence was insufficient. "Defendants claim that the Court’s 'rigid' four-hour time limit deprived them of a fair trial. . . . The jury trial phase of this case related to a single issue — damages. It is unclear why Defendants would have needed more than 4 hours to present their case or what other evidence they would have presented with more time. . . . The Court would have entertained a request for more time, had the parties demonstrated effective and efficient use of the time already given and a need for additional time." Are motions for a new trial ever granted? Conventional wisdom says motions for new trial are rarely granted. In this case conventional wisdom is exactly right. Since early 2008, at least 245 motions for new trial were filed in patent cases. Although most of the motions were denied, in a few instances – less than 20 – the court agreed that a new trial was necessary. This list provides summaries of the orders granting new trials either in whole or in part. The court granted plaintiff’s motion for partial summary judgment that defendant's therapeutic treatment selection patents were invalid under 35 U.S.C. § 101 of the Patent Act because they claimed unpatentable abstract ideas. "[The claims at issue] describe abstract ideas that are commonly performed by medical professionals in evaluating, considering and constructing treatment options for a patient presenting a specific medical condition. As with the claim examined in Prometheus, these ‘steps consist of well understood, routine, conventional activity already engaged in by the scientific community; and those steps, when viewed as a whole, add nothing significant beyond the sum of their parts taken separately.' . . . [T]he Court finds that the defendants’ claims mirror the mental processes that a physician performs, and therefore embody the ‘basic tools of scientific and technological work that are free to all men and reserved exclusively to none.’ Furthermore, the computing device references in the defendants’ patents may be ‘programmed to perform very different tasks in very different ways,’ and therefore cannot serve as a significant limitation or constraint on the claimed invention. . . . [T]he Court finds the defendants’ invention unpatentable." List of orders addressing invalidity for claiming unpatentable subject matter. Not a subscriber? Contact us today for a free 30-day password, no strings attached. The court granted defendants' motion to dismiss plaintiff's infringement action for failure to state a claim. "While [plaintiff] alleges infringement by Defendants’ 'network communications systems,' this is an extremely vague identification. . . . [Plaintiff] fails to identify what aspect of the systems are infringing and whether specific components of Defendants’ systems are allegedly infringing. Merely identifying the entire system and directing the Court and the Defendants to the claims of the [patent-in-suit] to determine what aspect of the system infringes is not enough. Additionally, the identification is not specific to either Defendant."